Tom Lorraine is hoping AFC Rushden & Diamonds knack of beating teams from a higher level in knockout competitions can continue this weekend. Diamonds, who sit in mid-table in the Evo-Stik Northern Premier League Division One South, take on Premier Division strugglers Coalville Town in the first qualifying round of the Buildbase FA Trophy at the Dog & Duck on Saturday. 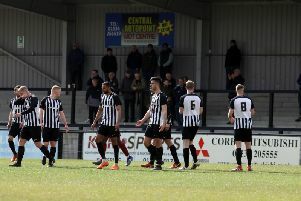 Since they were formed in 2012, Diamonds have picked up some notable results against higher-ranked opponents with wins over the likes of Cambridge City in 2013 and Ashton United last season while their best result in their short history came in the FA Cup in September when they won 3-1 at National League South side Concord Rangers. And frontman Lorraine sees no reason why the trend can’t carry on when Coalville come to town. “We go into every game, particularly at home, thinking we have a good chance of winning,” Lorraine said. “We have beaten teams from a higher level in numerous competitions over the past few years. “We know we are capable of beating any side within a league or two of us. “It’s always the same when you are playing a team from a higher level. We know we will have to perform well and we know we may need a bit of luck along the way. Lorraine, meanwhile, is pleased with how Diamonds’ season is shaping up after his header earned them a 2-2 draw with Basford United at the Dog & Duck last weekend. That made it seven points from three league matches in the space of a week. “I think we are doing well when you consider the number of games we have had recently and the number of injuries we have had to key players,” he added. “We had a good run in the FA Cup, we are still in the FA Trophy and when you look at the league table we have games in hand on a few teams around us. It’s a good position to be in. “At the start of last week, if you had given us seven points out of nine then we would have snapped your hand off. “But after winning the first two matches we want to go into the Basford game and win that as well. It was disappointing because I thought we were the better side but they caught us a couple of times on the break.